The men who created and refined the character of Bugs Bunny (Tex Avery, Friz Freleng, Bob McKimson) were anarchists at heart. However, the biggest “star” of all the animation crew, Charles M. “Chuck” Jones, was much more of a consolidator, a classicist. He was also possessed of a huge, throbbing ego (in this he was equally matched by Bob Clampett – both men claimed to have created almost all the major Warner Bros. cartoon characters on their own). In both cases, their egotism was justified by their outstanding artistic abilities. In Jones’ case, his obsession with style and technique was a double-edged sword. In some instances, it was responsible for the greatest “WB” shorts (such as Duck Amuck, 1953, What’s Opera, Doc?, 1957, One Froggy Evening, 1955); in others, it tended to overwhelm or underserve the narrative and/or jokes. Some of us would still rather undergo dental surgery than watch another Road Runner cartoon. In Wackiki Wabbit, fortunately, the balance between visual conception and gag content is well-balanced. 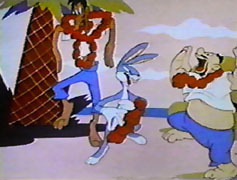 This was one of Jones’ early outings with the long-eared laugh-getter, and Bugs faces none of his traditional nemeses (Elmer Fudd, Yosemite Sam) here. Instead, a clever interpenetration of reality and fantasy puts the figures and voices of the short’s writers, Tedd Pierce and Michael Maltese, into the picture as Bugs’ would-be devourers. To the languorous strains of “Tradewinds”, we find two castaways floating disconsolately on a raft in mid-ocean, one skinny (Pierce) and one fat (Maltese). Jones’ elemental, semi-abstract design is clear from the start. The raft bobs up and down, out of the shot, backed by heavings of flat blue – much as a heavy swell might actually register to the eye. The result is disorienting and vertiginous, an approach that continues through the work. The straits are already desperate. Skinny sees Fat as a hamburger, murmuring longingly, “And… hold… the… onions. Hmm?” Fat in turn sees Skinny’s shinbone as a shining temptation, and salts it. (Where’d that shaker come from? This is the first of many of what Clampett termed “breakthrough” gags – non sequiturs and patent impossibilities that take every advantage of animation’s elasticity). When caught at his seasoning, he turns his head quickly, whistling innocently. The coy cravings continue until the classic desert island is sighted. “LAND!” the two cry, and as Skinny holds the sail, Fat puffs them ashore – and then some, until Skinny gives him a hearty slap (the comedy Law of Threes will be invoked here). Finally, Bugs appears. “What’s the good word, strangers?” he queries as he snacks on a carrot (evidently living on a Polynesian island in the moderate latitudes). “FOOD!” the two castaways cry, and with alacrity they set up a table, napkin, two chairs, and even a rose in a vase and a “Reserved” sign… as well as the stereotypical “cannibal” stewpot. Bugs is blithe and nonplussed, of course. Bugs’ unflappability is a hallmark that is rarely challenged. Bugs does not lose his cool unless he is playing up for effect, or faced with the supernatural (the gremlin in Falling Hare, 1943). He quickly exits and makes like Tarzan, swinging, via multiple cuts to give a stronger sense of acceleration, through a forced-perspective landscape of primary colors that is eerily reminiscent of Matisse. The two saps follow, and we are given the sight of a sarong-clad bunny doing a native dance, after which he exclaims “Ah, white man! Welcome!” and dispenses leis. The rabbit’s ability to recontextualise any potential conflict into an imaginary scenario of his choosing is his classic way of overcoming his opponents. Inveigling the two into more dancing, Bugs sinks away again. In keeping with the vaudevillian style, Skinny stops dancing first, contemplates Fat’s continued gyrations, and slaps him again – a nice Laurel and Hardy moment. The gags continue – a guidebook gotten from that strange offscreen space declares that natives dive for coins. Skinny flips one into the stewpot as Fat prepares to slam the lid on it. Bugs appears, and steals the stewpot (and the fire, too!) Fat brains Skinny with the lid. It’s all in the timing, folks. Bugs bathes nonchalantly in the bubbling pot as the hapless duo once again sets up the accoutrements for dinner (“MENU – RABBIT”). Bugs is content to order Fat the chef around like a masseuse, even flirting with him. It’s not until the two begin to sing, “We’re gonna have roast rabbit!” that the penny drops. What follows is the most distinctive portion of the piece. Bugs scoots upwards to – hmmm – his tree house, complete with mailbox. Stringing a plucked, cooked, chicken-sized carcass so that it functions as a marionette, Bugs gleefully torments his pursuers. The two eagerly jab their found dinner with a fork – and the condemned yells “Ouch!” and snatches the utensil from them. It’s a carnivore’s nightmare. It threatens the two, then for no reason at all betrays Bugs the puppeteer. Bugs changes places with them and departs, as Fat keeps waving bye-bye. He gets the third slap from Skinny. The two smile at each other, visualise each other as hot dog and hamburger, respectively, and pelt away down the beach after each other in cannibalistic rhapsody.